Once again, a great deal of confusion surrounds the European Central Bank's current policy objectives as well as the nearterm action expectations. Let's try to tackle the subject in a Q&A format. Q: Since the policy change announcement back in June, what has the ECB accomplished? A: In addition to lowering short-term rates, the ECB has launched the TLTRO program (4-year cheap loans to banks) and began its third covered bond buying program (these bonds are issued by banks and secured with loans). Q: What has been the impact of the ECB's interest rate reductions? A: The overnight benchmark rate has been set to near zero and the excess reserve rate has been moved to negative 20bp to incentivize banks to deploy capital. This has resulted in negative overnight interbank rate - banks pay each other to park their cash (which is still cheaper than parking cash with the ECB). Furthermore, the euro's decline that resulted from negative rates and a possibility of further easing is expected to provide support for the export-dependent euro area nations. Q: Has the rate action resulted in more lending in the euro area? A: The immediate reaction of the area's banks to the negative deposit rate was to buy massive amounts of sovereign debt, including periphery bonds. This has resulted in unprecedented declines in government bond yields across the yield curve. There is evidence however that credit conditions in the euro area are beginning to ease. Growth in broad money supply measures for example has improved markedly. However, it remains unclear whether monetary policy had much to do with this development. Instead the banking system deleveraging cycle, which started a few years ago, is gradually ebbing. Moreover, the conclusion of the ECB's stress tests should help banks deploy more of their balance sheets in the private sector without the uncertainty surrounding the stress testing process hanging over them. Q: How much in TLTRO loans has been taken up by the banking system thus far? A: About €90bn - see story. This is well below some of the more conservative projections. Q: How much ABS (asset backed securities, such as credit card and auto loan receivables) and covered bonds has been purchased since the announcement of the program? A: The ECB has acquired a small amount of covered bonds but no ABS thus far - see schedule. Q: What has been the impact on the Eurosystem's (ECB's) balance sheet? A: The impact has actually been a net decline, as banks continue to repay their MRO and the original LTRO loans. Q: Why hasn't the ECB been able to buy more covered bonds and ABS in order to have a visible impact? A: According to Credit Suisse, the total amount of qualifying ABS and covered bonds the ECB could purchase is around €140bn. The volume is insufficient for the ECB to accumulate substantial amounts of paper without massively overpaying and disrupting this market. And even if the ECB did purchase that whole amount, it would take too long and have only a limited impact on the balance sheet expansion (note: this is roughly the amount of paper the Fed would buy in 2 months during QE3). Q: There has been some talk of the ECB buying corporate bonds as well. Couldn't that help grow the balance sheet? A: Corporate bond purchases are a possibility, given the ECB can no longer afford to wait for the banking system to act as the area's policy transmission mechanism. According to Credit Suisse however, only about €100bn of corporate bonds would qualify/ be available for such a program. While it sounds like a large amount and would certainly cut borrowing costs for companies, the amount is insufficient to restore the Eurosystem's balance sheet to the 2012 levels. Q: How much then does the ECB need to expand its balance sheet in order to be credible? A: As discussed back in September, the ECB should probably grow the balance sheet by about €1 trillion. And the only way to achieve that is to augment existing programs with a more traditional QE effort that includes buying government bonds. Up to now there has been resistance from some Governing Council members (particularly) Germany, but supposedly Mario Draghi has been able to build consensus for such expansion - see story. That is why we had a rather sharp market reaction to the latest ECB press conference (see chart). Yet Draghi continues to downplay the €1 trillion balance sheet "target". Credit Suisse: - ... ABS and covered bonds add up to €140bn-odd of potential purchases. Adding a (putative) €100bn of corporates is wildly insufficient to achieve the "target" [€1 trillion]. This target therefore has to be downgraded, in our view, to "something I believe I might have mentioned" while the much more thorny issue of "proper" (government) QE is addressed. Q: Why do many of the Governing Council members all of a sudden are convinced that such a drastic action (€1 trillion expansion) may be needed? A: The persistently weak inflation readings have convinced them that Japan-style deflation risks in the Eurozone are quite real. Q: When (if at all) will the ECB begin to purchase government bonds? A: The ECB is likely to wait on any traditional QE for some time, even though it has started to prepare for it (some ECB employees have been asked to dust off the old Securities Markets Program - SMP). The goal is to see if another round of TLTRO will meet with more demand and if inflation stabilizes on its own. 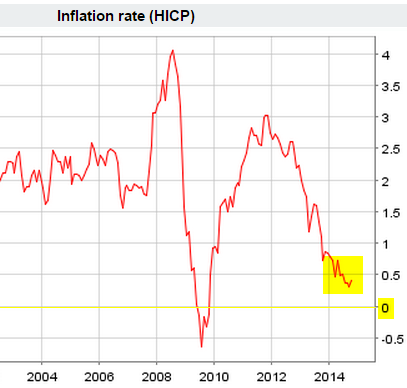 Q: Will all this monetary activity by the ECB stem the declines in inflation? A: The technique used thus far has been to talk down the euro by hinting that a "bazooka" monetary event is on its way. That approach has worked. Whether the weaker euro will ultimately end up generating a higher sustainable inflation rate remains uncertain.